Cheryl Rosa, V97, was also in the area for the first time, working on her dissertation about the health of Arctic bowhead whales, which the Native Iñupiaq people have hunted for thousands of years. It was 2000, and she had moved to Alaska to pursue a combined Ph.D. and wildlife residency at the University of Alaska Fairbanks. If anything, Alaska has sent Rosa spilling forward into a series of jobs, each more expansive than the last. She moved to Barrow fulltime in 2006 to conduct health assessments on populations of caribou, bowhead whales and walrus for the North Slope Borough Department of Wildlife Management. The department is, by all measures, unique. Oil money made it possible for the borough’s eight villages to develop and fund their own wildlife monitoring program to ensure the safety of their primary food sources; most of the villagers rely on hunting and foraging for some of their food. But the job required extensive fieldwork away from her husband and two young children. Getting around the North Slope isn’t like getting around other boroughs, especially during the long, cold winters, and research trips could last weeks at a time. So in 2010, Rosa landed at the Arctic Research Commission, an independent federal agency with offices in Washington, D.C., and Alaska. The job is as sweeping as its area of concern, covering 18 million square miles that stretch across 24 time zones and eight nations. 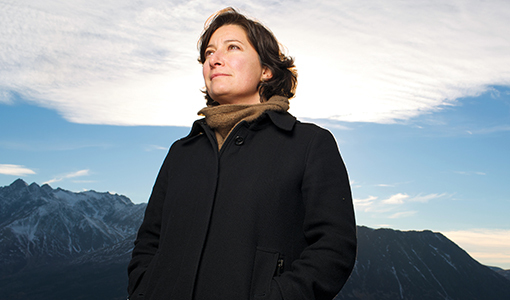 “The Arctic is this swirling mass of activity,” says Rosa. And the agency—which makes research recommendations to the president—checks in with everybody who’s doing related work both on the ground in the Arctic and at research labs around the world. On a given day, Rosa may gather information on academic, state or federal projects related to renewable energy, climate change, sea ice, how the polar bear population is doing, and challenges to the subsistence lifestyles of people in Arctic regions. Rosa also makes sure agency projects keep moving forward—though, as a veterinary student, she probably wouldn’t have guessed that so much of that work would involve sanitation issues in rural villages. Many villages don’t have plumbing, so they rely on “honey buckets,” five-gallon pails that serve as toilets and must be hand-carried and emptied into a central pit or holding tank, and communal wash basins. Both can spread more germs than they prevent. The Alaska Department of Environmental Conservation has established a water and sewer challenge, which Rosa likens to the Gates Foundation’s Reinvent the Toilet Challenge. Teams in the competition have been charged with proposing new decentralized systems that are house-based and employ innovative approaches for water reuse. “It really has the potential to improve the health and living conditions of rural Arctic residents,” she says. Still, Rosa hasn’t completely left the animals behind: She’s keeping her eye on research about the health of gray whales, an endangered species.